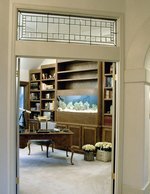 Removing algae from a fish tank is one of those never-ending chores that's part and parcel of keeping a healthy aquarium. Algae are microscopic organisms that float free in the water or grow on aquarium walls, ornaments, plants and other surfaces. Algae can be green, red, purple and other colors, and they grow in a range of forms including threads, patches and water discoloration. All fish tanks have some algae, and usually they affect only the appearance of the tank, but excessive algae growth can be harmful to fish. Overstocking a fish tank can cause problems with algae. Reducing excessive nutrients and light offers the best long-term solution to algae in a fish tank. Algae nutrients include decaying fish food, fish feces and other organic matter. Algae also thrive in high light levels. Feed your fish only as much food as they can eat in 30 seconds to one minute. Never feed them so many fish flakes that some fall to the aquarium floor before they're eaten. Don't expose your fish tank to more than six to eight hours of light per day, and don't place it in an area that receives direct sunlight. Set an aquarium light timer to turn them on and off at particular times of day. New fish tanks often experience algae blooms while the tank is settling into a healthy cycle. The water in new tanks usually turns clear naturally over time. Regular cleaning and water changes can keep most algae problems in fish tanks in control. Take ornaments out of the aquarium and clean them with an algae pad. Soak the items for five minutes in a solution of 1 part household bleach to 20 parts water. Rinse them thoroughly in clean water until you cannot smell bleach on them. Pull algae growths out of the tank, and scrape algae off the tank walls and other surfaces with an algae pad or other specialized cleaning tool. Don't use kitchen cleaning equipment; these can contain chemical residues that are harmful to fish and plants. Change the tank water after cleaning. Tap water contains nutrients that help algae thrive, so before adding it to your aquarium, apply a water chemical neutralizer or use a reverse-osmosis/deionization or RO/DI filter. Replace up to 30 percent of aquarium water with fresh water every week. Green water often clears if you'll conduct daily changes of 10 to 15 percent. 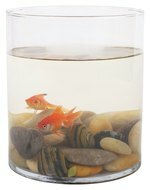 Aquarium filters and sterilizers help control algae. Biofilters keep water healthy for fish; without a biofilter, water can turn green. Diatom/micron filters help turn green water clear. Protein skimmers filter aquarium water and remove the organic matter that algae feed on. A UV sterilizer is another solution for excessive algae in a fish tank. Water passing through a UV filter is exposed to light that kills the algae. A UV sterilizer doesn't control algae attached to surfaces in a tank, but it controls algae spores and helps prevent growth; it kills aquatic microorganisms that pass through it but does not eliminate dead algae from the tank like a filter would. Several fish, snails and crabs eat algae and are effective at keeping algae growth under control in a fish tank. Chinese algae eaters, plecos and other fish include algae in their diet, though they don't eat all types of algae and so therefore will not necessarily eat the problem algae in a tank. Feed algae-eating fish with algae tablets or vegetables when they've cleaned the tank to prevent starvation. Another option for controlling algae is to add algae-eating snails, crabs or other creatures. Like algae-eating fish, none of these species eats all algae varieties. To cover all the possible algae types, aquatics suppliers market a cocktail of living organisms under names like algae crew, algae control package and reef janitor. Commercial algae-treatment chemicals can be effective in the short term. However, long-term effects can include dead algae polluting the water, filter damage, and harm to snails, shrimps and other aquatic life.